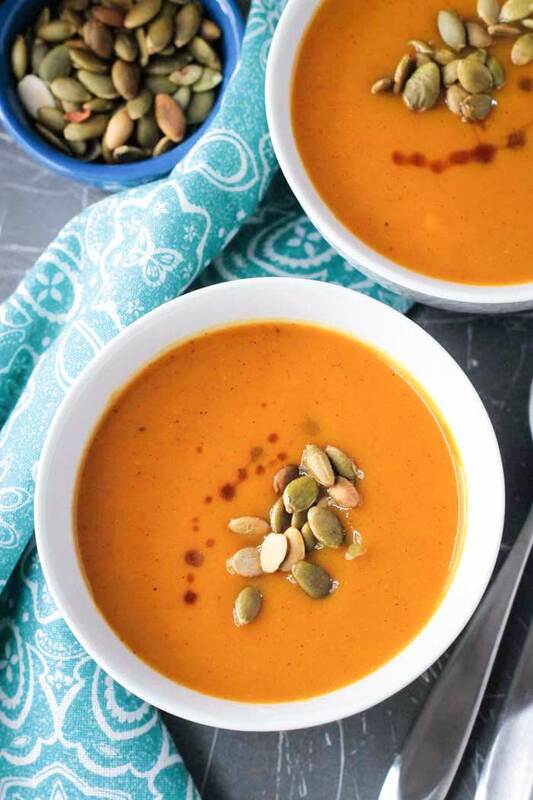 Butternut Squash Apple Soup – this fall inspired soup is silky smooth and perfectly spiced. Perfect for a cozy weeknight dinner or the starter for your holiday meal. This time of year, pumpkin tends to get all the love. But, for me, butternut squash is king. It’s earthy, but sweeter than pumpkin. Lighter and more delicate in flavor, too. It can be steamed or roasted, then eaten in cubes or mashed or puréed. You can even eat the seeds, just like you would pumpkin seeds. 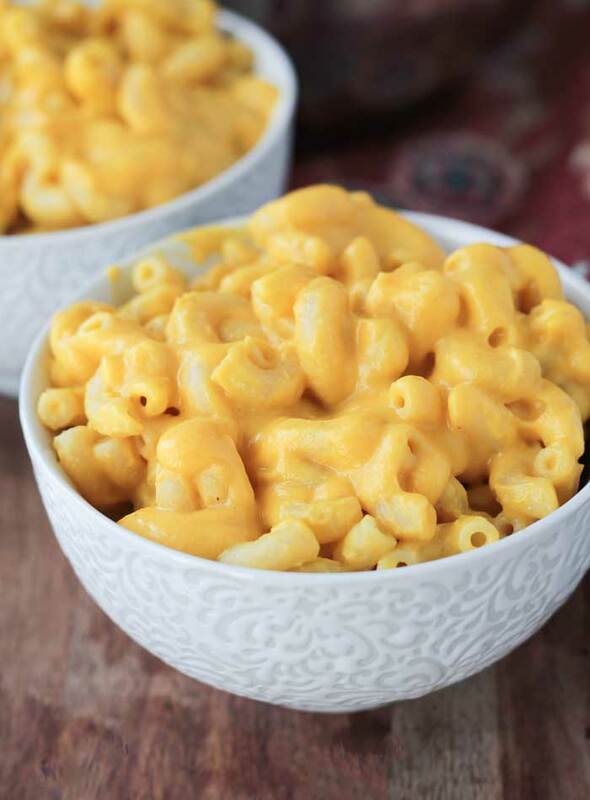 This orange winter squash is the creamy base for my Dairy Free Mac and Cheese (a huge reader favorite!). And, in this dish, I’ve turned it into an ultra creamy soup (because y’all know I’m obsessed with soups!). I think this Butternut Squash Apple Soup will become a staple on your table during the fall season. This creamy soup is the epitome of fall for me. The smells, the warmth, the flavors. Everything about it makes me feel all cozy inside. 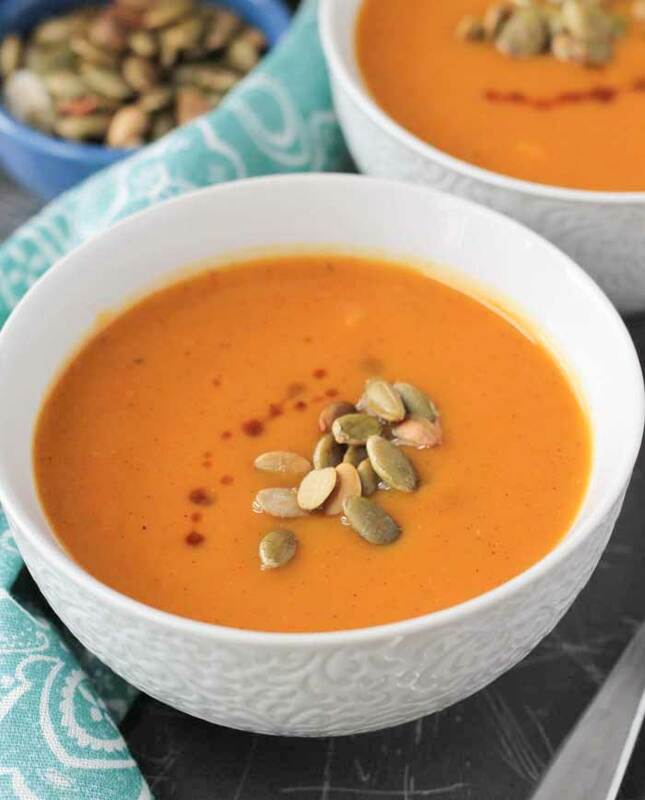 When the first wafts of crisp autumn air arrive all I want to do is make a big pot of this Butternut Squash Apple Soup and curl up on the couch with a comfy blanket. 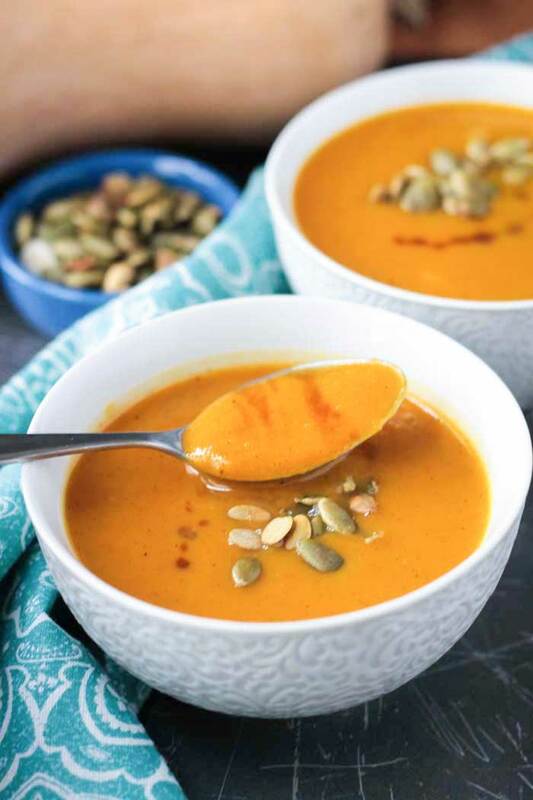 This dairy free squash soup is super easy to make. It takes less than 45 minutes from start to finish and the majority of that time is hands off. It’s also packed with nutrition, boasting high amounts of vitamin A, vitamin C, fiber, B vitamins, potassium, folate, vitamin K, healthy fats, and antioxidants. Not only did I create this soup with butternut squash and apple, but also carrots, cinnamon, curry powder, turmeric, a splash of plant milk, and just a touch of pure maple syrup. 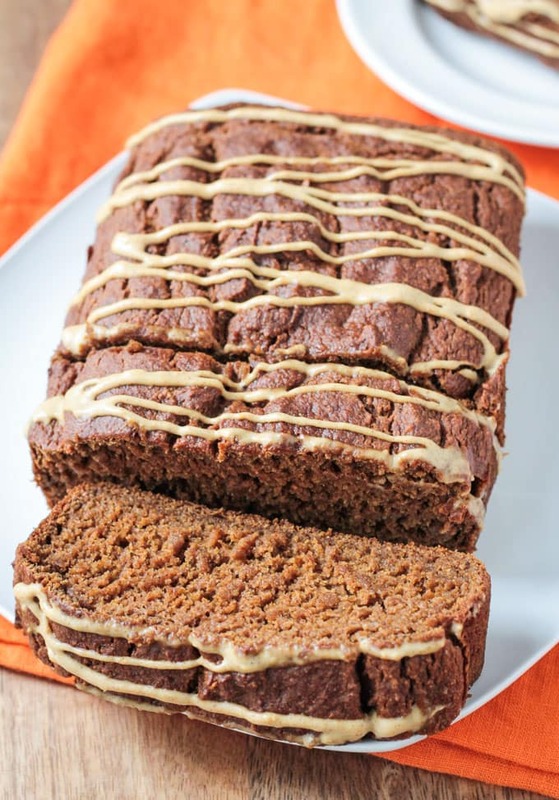 It’s the perfect balance of sweet and spice and cozy fall flavor. I love this soup ultra silky smooth. You can use an immersion blender to get this consistency or carefully transfer the soup to a blender. However, I still love to have texture in my meals. 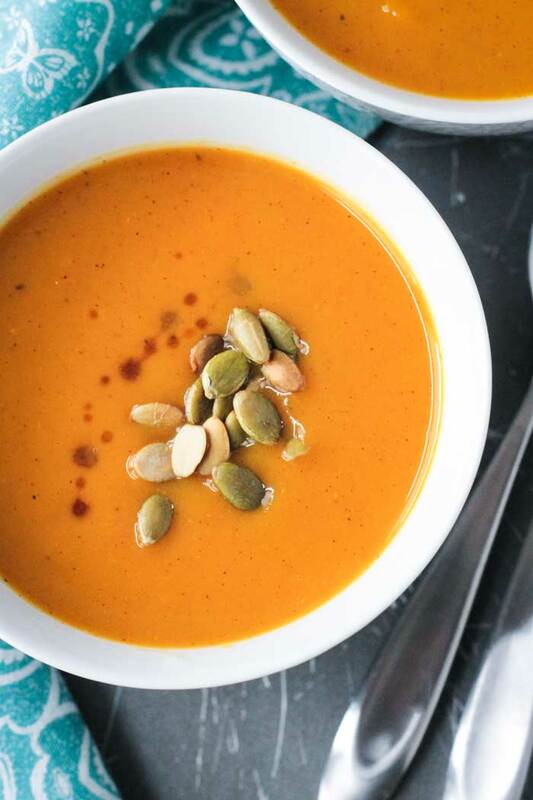 I really love the contrast of crunchy roasted pumpkin seeds as a garnish for this Butternut Squash Apple Soup (just like they do at Panera with their Autumn Squash Soup and, yes, this soup is roughly based on that one). I can’t wait for you guys to try this Butternut Squash Apple Soup! I hope you love it and much as we do! Please come back and leave me a comment below with your feedback and star rating once you try it. You can also find me on social media. Be sure to tag @veggie_inspired and #veggieinspired so I’m sure to see it. Enjoy! This Butternut Squash Soup is silky smooth and perfectly spiced. The perfect fall inspired dish for a cozy weeknight dinner or elegant enough to be the starter for your holiday meal. In a soup pot on the stove, add the squash, carrots, apple, broth, salt, pepper, cinnamon, curry powder, and turmeric and bring to a boil. Turn down to medium, cover and let simmer for 25-30 minutes until the squash and carrots are very tender. Remove from the heat and add the cashew milk and maple syrup. With an immersion blender***, purée the soup until silky smooth. Serve immediately garnished with roasted pumpkin seeds and a drizzle of pure maple syrup, if desired. *I like this vegetable broth for this recipe because it has a nice light yellow color. **To roast pumpkin seeds: 1/2 cup raw shelled pumpkin seeds, 1/4 tsp oil, 1/8 tsp salt. Roast in a single layer on a parchment lined baking sheet at 325 degrees F for about 20-25 minutes, shaking the tray half way through. All ovens are different, so keep a close eye on them so they don't burn. ***Alternately, you can carefully transfer this soup to a blender to purée. Thanks, Jenna! I love my immersion blender!! Hope you love the soup! Great recipe. Makes me want to “actually” eat my squash. Made the following mods with great results:heated a couple tablespoons olive oil and when hot added powdered seasonings until fragrant (really brings out the flavor) then I sautéed the carrot to bring out the natural sugars. Used creamy coconut milk and then used the rest of recipe as written. THIS. And I can eat everything in it. It’s a keeper. Pinning! Thanks, Sina! I love the little something extra the apple gives – sweet, but tangy. I can’t wait to hear what you think! Enjoy! I really love butternut squash! I love how you combined it with apple in this soup. I have my immersion blender ready! I love my immersion blender – use it all the time! Thanks, Amy. I hope you enjoy! My favorite fall squash!!!! This soup looks so comforting and I love that you added apple to it – I honestly never thought to try that! We’ve been working on perfecting the measurements for a butternut squash soup of our own, but mine never turns out this pretty or smooth! ha! I absolutely have to try this recipe!! Oh, this sounds like the perfect quintessential fall soup! I know what you mean about pumpkin getting all of the love. As far as squash goes, delicata is my top choice. But I’d happily snuggle up to this butternut squash soup! I wouldn’t turn down a delicata either…or an acorn – love those too. Thanks, Cadry! I’ve never tried an apple soup before – that’s so interesting! I hear you about pumpkin getting all the love (I’m obsessed too) but I’ve been roasting up some butternut squash too. I’ll have to get some more to try your soup! It’s just one apple in there, but it gives a really nice tangy sweetness n the background. Thanks, Mary Ellen! Just what I was wanting. Thanks for the lovely recipe. 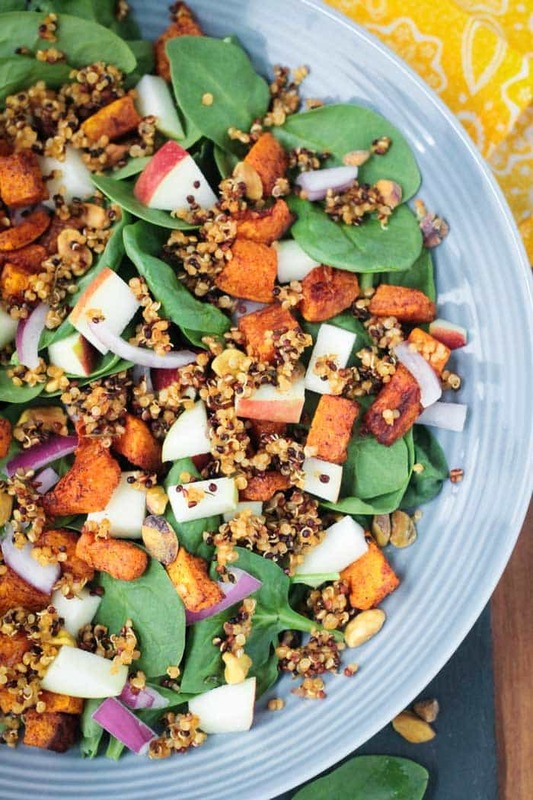 What gorgeous flavours and so perfect for fall! I’m big on butternut squash and apples together! I have a burger with those flavors on my site and it’s super popular. Perfect idea to make a soup with them! Oh, yes, I have seen that burger and it looks amazing! Thanks, Sophia! This looks like my type of soup! I have a bunch of apples in the fridge from apple picking a few weeks ago, and I’ve been looking for creative ways to use them. Thanks for this recipe! Perfect, Dianne! The apple give this soup a really nice tangy sweetness. I hope you love it! I’m all about soup right now. I love butternut squash, it makes the perfect base for a creamy soup like this. It looks delicious, Jenn! Thanks, Linda! I just saw you posted a butternut squash stew today that looks divine as well. So much goodness to go around! That looks like a cozy bowlful of fall! Thank you! I definitely think so! I love how good sweet squash soups can be. My very first “blended” soup was my butternut and carrot soup, so creamy and that natural sweetness that’s even more pronounced when you roast the veg! Love the extra apple goodness in this one! Thanks, Rebecca! 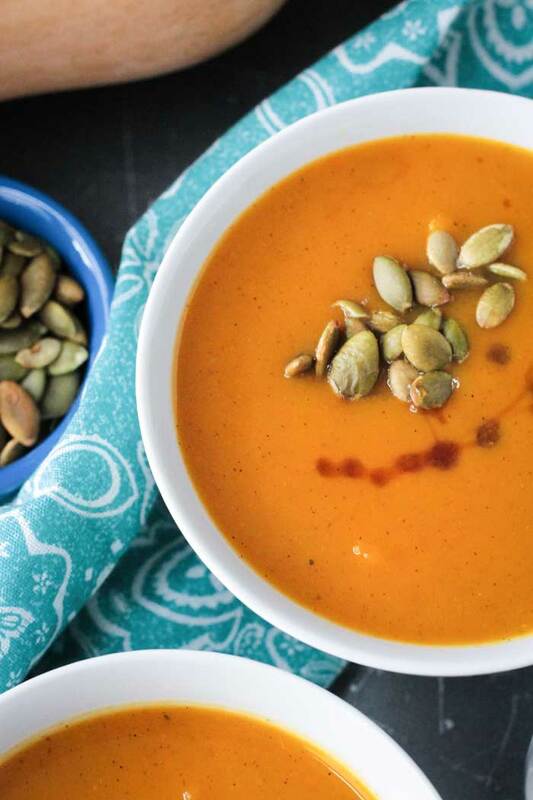 There is nothing better than creamy squash soup in the fall! So cozy!